Today, I decided to go down to the Wharf to get crabs and see what me and my camera could come up with. Seating at the light I saw something in the distance that was intriging, but I wasn't quite sure of what it was. Getting excited, I forgot that I was in the left turning lane. Lucky for me the other car was going right not straight. 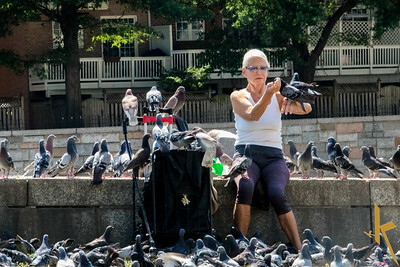 When I crossed over, to my amazement I watched and this women was one with the pigeons. Talking to them, feeding them, handling them without a care in the world. 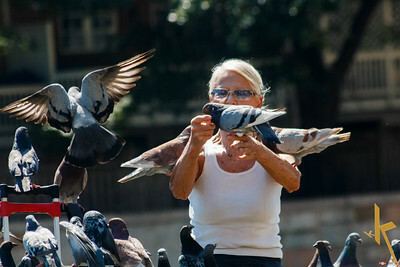 This reminded me of the song from the movie "Mary Poppins" "Feed the Birds."